The start of a new year is always exciting for an editorial team as that's when we plan the features for the year ahead. We've listened to your feedback and spoken to some experts, and the result is two new series for you to enjoy in 2018. One will focus on complementary therapies (see page 8 for a review on acupuncture). 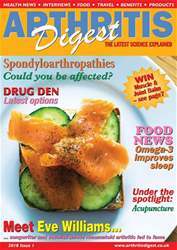 The other is taking on the spondyloarthropathies, which Prof Oliver FitzGerald introduces on page 15. 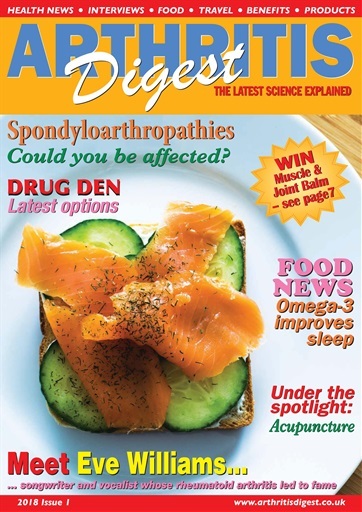 Throughout the issue we review all the most recent research in the arthritis arena along with new drugs, products and systems that could make a difference to the lives of people with chronic pain. Community dietitian Chloe Hall discusses the latest findings in food and nutrition. And if you're looking to get away, turn to the back of the issue for some relaxing breaks that offer acupuncture.